When my friend Darren asked for help to produce a new headshot to use on his website and social media, I was happy to oblige. We decided that a white backdrop would give the most flexibility across various platforms – LinkedIn, Facebook, etc. The white paper roll was lit with one Elinchrom flash unit – bare bulb with reflector dish and barn-doors to avoid light spill. I lit Darren with another Elinchrom fitted with a large softbox. Very simple lighting, easy to setup. See the diagram below. 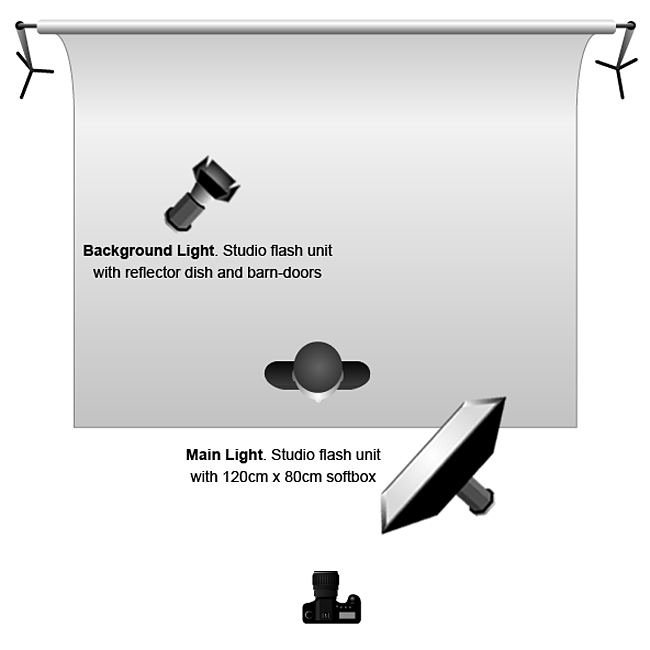 See this earlier blog post for more information on lighting a white background. How do you like your crop? I’m personally a fan of tight ‘head chopped’ crops in headshots, as pioneered by the likes of Peter Hurley. I feel that it can help to focus more attention on the eyes. I realise though that some people prefer to show the whole head (there are some strong ‘anti-head chop’ views on photography forums.) So I’ll often shoot wide with the intention of cropping to suit in post-processing. The images below, chosen by Darren as his favourites, illustrate the full head and the chopped versions side-by-side. Do you have a preference? Click to see them bigger and feel free to leave a comment or question.